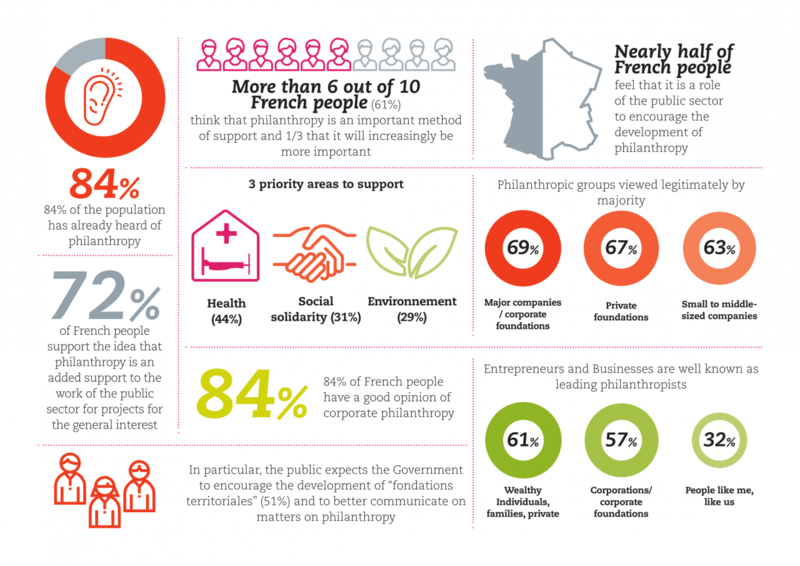 On October 2017, Admical, a Paris-based NGO and the French Local Authority of the Global Exchange, published a first-of-its-kind study in partnership with the institute of studies Kantar Public, which aimed to understand French people’s opinion on philanthropy. Evaluate the public perception of philanthropy: how do people perceive philanthropists and which images could define them? Understand the population’s expectations on this subject. More than 8 out of 10 French people know the word « mécénat » (philanthropy). Sixty-one percent of respondents consider it an important tool for funding societal projects, and 1/3 of French citizens think that it will become more important in the future. People also assigned very positive values to philanthropy, such as commitment, sharing, innovation, passion, dynamism, ethics, and authenticity. For French people, philanthropy represents a real opportunity to create social relationships and welfare, and to give a better image of the country. Read more at CECP Insights Blog.